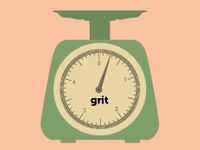 By adding Angela Duckworth's 12-item grit scale to the standard assessments, one school is investigating the possibility of measuring and teaching its students grit. Like many high schools, we certainly believe in data. Though we are not data-driven, we strive to use data to inform decisions that affect teaching and learning. We use all sorts of data -- from ERB scores and PSAT, ACT, and SAT information to AP exam results -- to help us shape and focus our instruction each year. However, this data provides us with only a glimpse of a few facets of students who are complex young men and women. Along with my leadership team, I began a search last year for a way to collect a different kind of data on our students, both current and incoming, that will help us understand them a little better, and will better equip us to put students in a position to be successful. The catalyst for this search centered on why some of our students seem to overachieve and exceed expectations each year while others seem to underachieve. We were already familiar Angela Duckworth's well-known research on grit, but we drilled down deeper to see if it might prove meaningful for our students. We then decided to explore ways that Duckworth's research on grit, including her grit measurement scale, might help us better serve our students. Upon agreeing that this metric could be a valuable tool, we began our data collection immediately. Starting with our middle school's eighth graders, we administered Duckworth's 12-item grit scale (PDF, 147KB) in the spring semester prior to their freshman year. This takes less than ten minutes of the students' time, so the process is quite efficient. My leadership team then scored the completed scales and added them to the students' files. As we're an independent school that accepts a number of new students each year in grades 9-12, we turned next to our incoming students, those who had applied for admission for the 2014-15 school year. After collaborating with our director of admissions, we added the 12-item grit scale to our traditional battery of admissions information (testing, grades, recommendations, etc.). When we returned to school in August, we administered the 12-item grit scale to the remainder of our student body and are now cataloging that data, too. We have both short- and long-term plans of action related to this grit data, plans that can be used at any school and not just an independent college-prep high school. In the short-term, we will watch our students carefully as we move through the school year. As we notice either overachievement or underachievement with individual students, we will consult those individuals' grit scales. We believe that with an underachieving student whose grit score is below average, for example, we can help by offering strategic advice and encouragement related to grit. Duckworth defines grit as "tendency to sustain interest in and effort toward very long-term goals," so we will focus our encouragement on that as well as on equipping that student "to pursue especially challenging aims." With overachievement, we likewise will consult students' grit scales, but will work to find correlations between overachievement and grit. Our short-term plan will be actionable with all of our students beginning in the fall semester. Our long-term plan of action involves using the grit data to inform decisions that affect teaching and learning. We have already begun planning ways to bring our students' attention to the concept of grit and the correlation between grit and success, according to Duckworth's research. Specifically, we are mapping out ways to address grit in large settings like chapel, school assemblies, pep rallies, and open house events for both current and prospective families. We also are working with our athletic and fine arts departments to address and promote grit among our athletic teams as well as with our performing arts casts and ensembles. Furthermore, we will be working with each academic department to incorporate allusions to grit in the classrooms. We may do this through the inclusion of curriculum-related articles, finding grit in fictional characters and historical figures, or labeling especially challenging problems "grit work." Our counselor will also be included, as she has opportunities for one-on-one conversations with students about grit. Ideally, a year from now, then in two years, and so on, we will find that we have made a difference in our students' lives. Our goal, of course, centers on nurturing grit to help them become more successful, particularly over the long haul. We anticipate seeing anecdotal evidence of increased grit, but we hope the data will support us. We will look for this data when we re-administer the grit scale annually and search for trends in the scaled scores. Will incorporating the grit scale and strategic conversations about grit into the culture of our school help us to produce grittier and ultimately more successful kids? Time will tell, but we are committed to this long-term and especially challenging goal. Have you made grit a part of your school's academic program? Please share your thoughts in the comments section below.